The world-famous original name brand of platinum catalysis warmers since 1923. 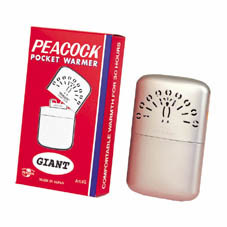 The PEACOCK pocket warmer makes use of the chemical principle that vaporized benzine (hydrocarbon) generates heat when in contact with platinum. The heat generator neither ignites the benzine (not benzene) nor produces flames. It requires the use of a match, cigarette lighter, or electric cell solely for achieving the necessary temperature to allow platinum to begin catalysis. The catalytic reaction of platinum decomposes vaporized benzine into carbon dioxide and water. 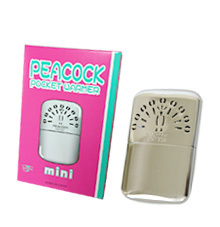 The PEACOCK pocket warmer utilizes oxidation heat generated during the catalytic process. This is an advanced pocket warmer, safe, clean, and environmentally friendly. the support of people throughout the world. The PEACOCK works only by platinum catalysis, which causes neither air pollution nor occurrence of waste, and contributes to the environmental protection. The newlydeveloped platinum-catalyzed glass fiber burner offers quick and sure lighting. The PEACOCK gives constant warmth for a full day on just one fill(2cups＝25ml)of fuel. Usable even in extreme cold -40℃ temperatures. Produces approximately 5 times as much heat as disposable warmer. 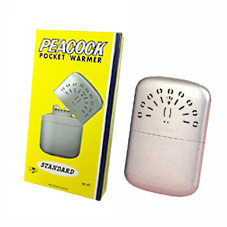 Long-life design provides many years of service.Once purchase a pocket warmer, reusable only to replace the burner. The body is totally brass-nickel finished for Quality-conscious design,and the warmer's light Weight and small size make it easy to use. 1) Take off the perforated top cover from the warmer, and remove the burner by holding it lengthwise. 2) Insert the bottom of the filling cup into the open mouth of the fuel tank, then pour fuel into the filling cup until it reaches the upper line. 3) Rotate the filling cup 90°in either direction to allow the fuel to flow into the warmer. 4) After all fuel has been absorbed, remove the filling cup. Hold the warmer upside down and then press it lightly with fingertips 2 or 3 times to discharge the excess fuel into the filling cup or a receptacle. 5) Carefully replace the burner. 1) Apply a fire to the burner element by a match or a cigarette lighter for 3 to 5 seconds. 2) Replace the perforated top cover. pure white gasoline, or lighter fluid (e.g.,ZippoR ). Ideal for winter sports and outdoor work of all kinds. Especially suitable for skiers, hunters, golfers, spectators, skaters, police officers, railmen, farmers, fishermen, seamen, stevedores, lumberjacks, etc. Recommended for anyone who is cold or is sick with a cold, influenza, neuralgia, rheumatism, or lumbago. However, consult your doctor before using the pocket warmer. Each warmer is individually packed containing cloth pouch,filling cup,and instruction maunal. A display box contains 12 individual packages. Each burner is packed in a pair. One-dozen box contains 6 individual packages. ☆ Ideal for winter sports and outdoor work of all kinds. railmen, farmers, fishermen, seamen, stevedores, lumberjacks, etc. rheumatism, or lumbago. However, consult your doctor before using the pocket warmer.